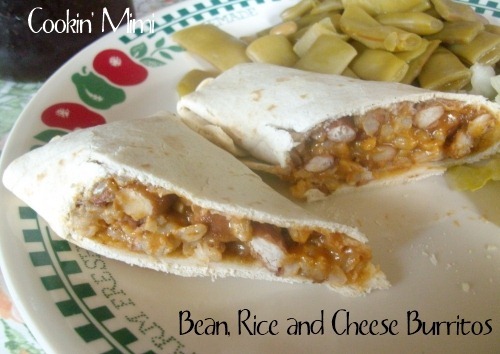 These freezer friendly Bean Rice and Cheese Burritos are great for lunch or dinner. We usually eat at least one meatless meal a week and these fabulous burritos are one of our staples. Filled with brown rice, pinto beans, cheese, and seasonings they freeze wonderfully which is good since my recipe makes about 20 burritos. 2 packages of 10 count flour tortillas. I think they’re the size right below burrito size. My tortillas came from Aldi and they only have one size. Add the dry bean to a 4 quart or larger slow cooker and cover with water by an inch. Add salt and pepper to taste, cook on low for about eight hours or until beans are tender. If you don’t have a slow cooker you can put the beans in a similarly size Dutch oven or stock pot. Bring to a boil, reduce heat to simmer and cook covered for about 2 hours or until tender. Drain most of the cooking liquid off the beans, cool and refrigerate. While beans are cooking, preheat oven to 350 degrees. Measure your cup of rice in to an oven safe dish like a glass casserole or 9 x 9 brownie/bar pan. Bring the liquid called for on the bag of rice to a boil add salt and butter if desired and pour over rice. Cover with lid or foil and bake for an hour or until liquid is absorbed and rice is tender. When beans and rice have cooled, place in a large bowl and add cheese, minced onions, taco seasoning and a few shakes hot sauce. Mix well. Warm tortillas until pliable and add a large spoonful of the filling mixture and fold. I’ve included a video from Tammy of Tammy’s Recipes showing a good burrito folding technique. Repeat until all the tortillas and filling are used. Wrap burritos in foil, freezing what you don’t eat that night. Heat wrapped burritos in a 325 degree oven until heated through 25-30 minutes for freshly made and 35-45 for frozen. This post may be linked at these fabulous blogs as well as Weekend Potluck.